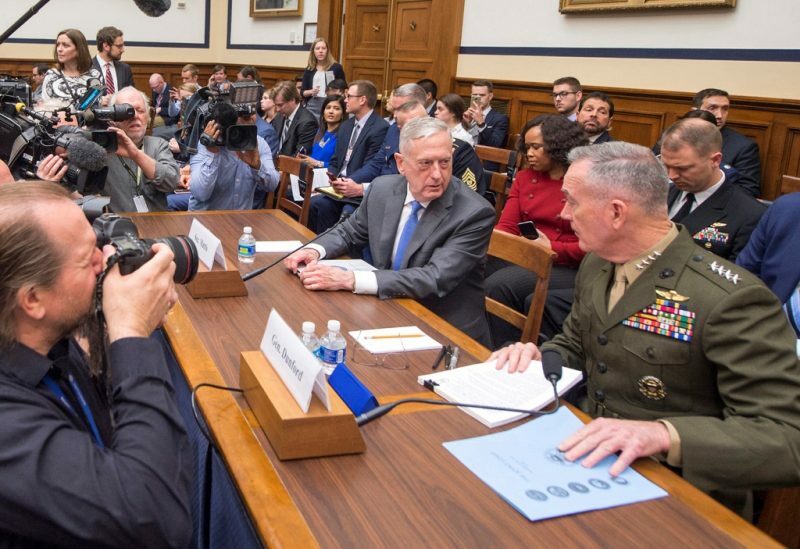 Defense Secretary James N. Mattis and Marine Corps Gen. Joseph F. Dunford, Chairman of the Joint Chiefs of Staff, provide testimony to members of the House Armed Services Committee in Washington D.C., April 2018. Photo: US DoD. On the same day that he presided over the launching of strikes against Syrian chemical warfare facility targets, US Defense Secretary James Mattis along with Chairman of the Joint Chiefs of Staff General Joe Dunford, gave testimony to members of the House Armed Services Committee in Washington D.C. The two top men in the American military – aside from the President who is Commander-in-Chief – outlined a pressing need for the USA to develop what can be termed all-domain defences. They spoke of a need to not only achieve supremacy in conventional military capabilities, but also to counter a new ‘grey zone’ in modern warfare that has in recent years been exploited not only by terrorist groups like Al-Qaeda and ISIL, but also the Russians and Chinese (the latter via activities in the South China Sea). Terrorists have since 2001 used airliners as kamikaze aircraft against the World Trade Center in New York, staged slaughter of civilians in Western European cities using backpack bombs, kitchen knives and lorries, not forgetting small boats as high-speed bombs against both naval vessels and merchant ships. They have seldom dared to come out into the open, for fear of serving themselves up in a conventional fighting environment where the dominance of the USA and its allies is overwhelming. ISIL made that mistake with its so-called Caliphate and found itself subjected to an intense air campaign. After being annihilated in its captured towns and cities, ISIL is now melting away, to reform and fight on in a more asymmetric way. 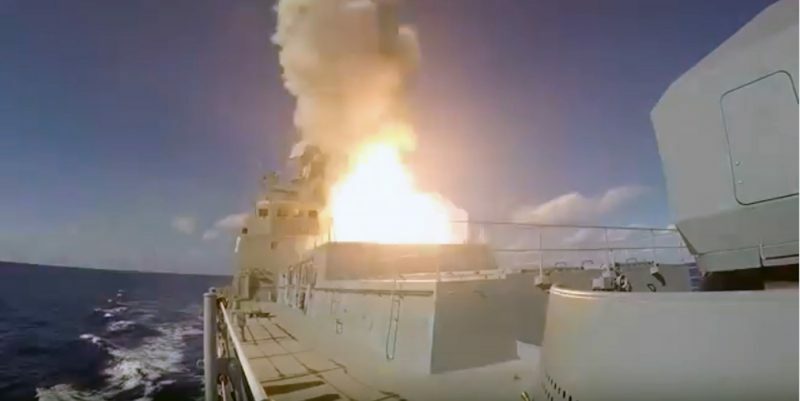 Deep strike muscle – a Russian Navy frigate fires a Kalibr land-attack missile into Syria, projecting power far from the sea. Photo: Russian defence ministry. Similarly, Russia has sought out means to avoid confronting the USA and the West openly, developing its conventional military capabilities but also cultivating hybrid warfare that exploits the ‘grey zone’, including cyber warfare and deniable actions by espionage operatives on foreign soil. When they gave evidence to the House Armed Services Committee, Mattis and Dunford – both US Marine Corps generals, though the Secretary is retired from active service – explained that Russia’s doctrine has been named after its own Chief of General Staff, General Valery Gerasimov. An exemplary use of the Gerasimov Doctrine was the annexation of Crimea in March 2014 when so-called ‘little green men’ (marine infantry and special forces soldiers deliberately not wearing insignia to create confusion and hesitancy in any foe) spearheaded the operation. This has also been described as ‘war in peace’ where military forces may appear to be peacekeepers at the outset of an intervention, but actually aim to assist one side against the other without declaring their motives as such. That is, in effect, what has happened in the Syrian Civil War, with the Russians intervening militarily to allegedly restore peace and order – and fight terrorists – but the real aim all along for Moscow has been to secure its naval base at Tartus and therefore guard Russia’s southern flank. Ensuring a permanent naval presence in the Mediterranean enables Moscow to counter the naval forces of the West and the southeasterly expansion of NATO, and above all the power and influence of the US Navy. In conventional military and naval terms the Russians cannot hope to compete against the USA and its allies. Yet, if they can leverage the influence of modest, yet highly effective, naval forces – such as new Improved Kilo Class submarines and Kalibr cruise missile-armed corvettes and frigates – without provoking open warfare they might just succeed in their aim of countering, and containing, the West and NATO in particular. Secretary Mattis believes it is Vladimir Putin’s aim to ‘shatter’ NATO and the ambivalent attitude of President Trump towards the alliance – and his castigation of European members for not spending enough on defence – seems to play into the Russian leader’s hands, though it can only bolster the West if more is invested in military and naval forces. 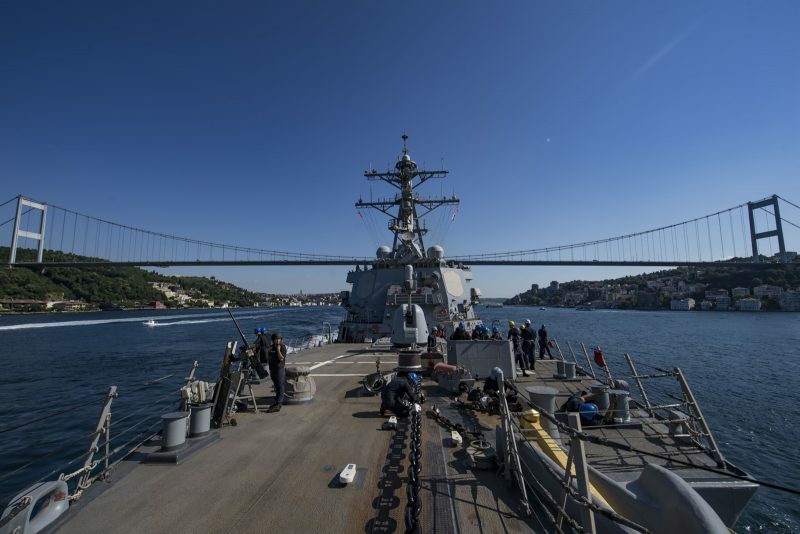 Part of the US Navy/NATO riposte to Russia’s annexation of the Crimea and more assertive presence at sea: The destroyer USS Porter transits the Bosphorus Strait in July 2018, during a patrol in the eastern Med and the Black Sea. Photo: US Navy. Meanwhile, Russia’s support for the Assad regime – and the use of information warfare to suggest it was even the UK’s spies and Special Forces who manufactured the gas attack in Douma rather than Assad’s forces – is all part of exploiting the grey area. Assad achieved his aim of capturing the city in the wake of the chemical attack – another step to securing Tartus for the Russians – while the mere threat of a bloody clash between Russian forces and the US-led strike force assembling off Syria, meant retaliatory air strikes were so limited they could not alter the course of the war, which was already running firmly in Moscow’s favour. Within days of the strikes, reports emerged of Russia seeking to create a naval support facility in Somaliland, close to the Bab-el-Mandeb Strait, a chokepoint for world sea trade. This will give the Russians a hub for operations East of Suez and mean they can, potentially, close off both ends of the Suez Canal, or sponsor disruption such that it gives them more strategic leverage. President Vladimir Putin has openly stated Russia’s determination to undermine American naval hegemony and this is part of that. That then, is the landscape of the ‘war in peace’ waged by Russia of which the Syrian conflict is but one element. It is far from certain that, beyond the corridors of Washington D.C., political leaders in the West quite grasp the existential nature of a multi-faceted threat, which requires that the USA’s allies also develop all-domain defences. That inevitably means greater investment in conventional military and naval capabilities as well as areas of non-conventional defence. 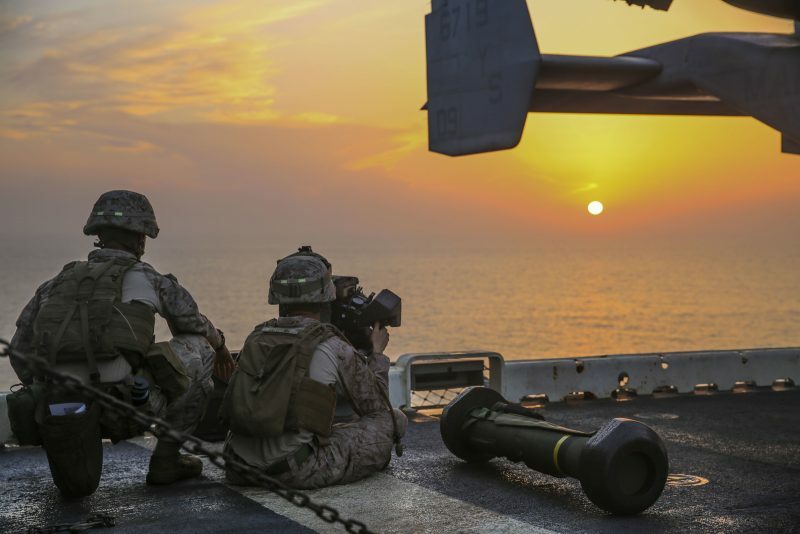 US Marines from the 26th Marine Expeditionary Unit (26th MEU) scan the horizon while transiting the Bab-el-Mandeb Strait aboard the Wasp Class amphibious assault ship USS Iwo Jima. Note the shoulder-launched missile ready to fire lying next to them. Photo: USMC.